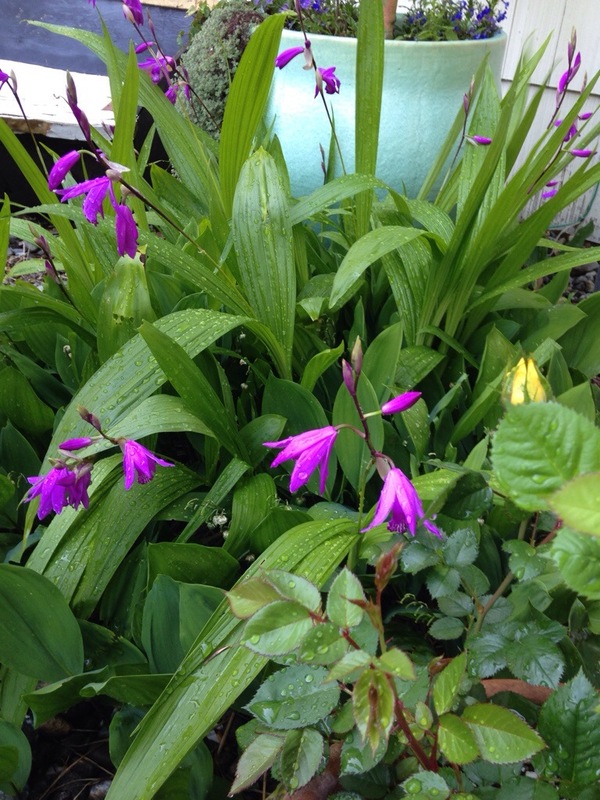 I like this plant, Bletilla striata. When we moved into a new house this winter I saw a patch of dead leaves and wondered, what is that??? They were long with parallel veins and I thought, maybe Crocosmia? In the early spring some green started to peek out and flower buds formed. It soon became apparent that the new growth was Lily of the Valley, you can see the remnants of their flowers in the pictures below. But I knew that the dead leaves I had seen were much longer than Lily of the Valley, so I was quite puzzled until I saw another set of leaves poking up through the Lily of the Valley. Here comes that mystery plant I said to myself. It was such a delightful surprise to see the rich purple blossoms of the hardy ground orchid opening up. I have an orchid in my garden! Bletila striata is right outside my back door! I feel like I’ve reached a new level. First I earned enough points to have a garden with just pansies and petunias. Then after putting in the required time I reached the level of roses and Japanese Maples. Now, after hours of searching and jumping and solving (yes, I’m thinking Mario World) I made it o the Orchid level! Okay, I actually cheated at this game by taking a time warp tunnel to this level, because I didn’t plant it myself…it just appeared! Regardless of how I arrived, I am really happy to be at this level and I wonder, what’s next??? Said to be the easiest terrestrial orchid to grow! When I have something come up in the garden that was unplanned it is usually an invasive weed…What amazing luck.